Stanchions, Crowd Control and More: Water Wall Barriers & Fencing...There's a Correct and Incorrect Way to Use Them! Water Wall Barriers & Fencing...There's a Correct and Incorrect Way to Use Them! Keep an area or construction zone private and secure with the new water wall fences from CrowdControlExperts.com! In today's environment a secure work area is critical to ensuing the safety of the work zone and the workers. Whether it is on the side of the road or a secure building area, the movable and portable water wall fences can provide that high level of security and safety you need. The water wall fences easily retrofits to existing water walls to create an imposing and secure barrier for unwanted entries. The water wall fences are made from 11 gauge galvanized steel mesh connected to vertical steel posts of 1 ⅝" diameter providing excellent security and visibility. Fence sections interlink with the water walls to provide better overall stability and allow for easy changes in ground height. The water wall fences can rotate up to 30° for easy layout and encircling of job sites. There is an additional hole for a security bolt to secure the fence to the water wall to prevent unwanted entries. There is no need to remove the fence to fill the water wall, fill caps are easily accessible with fence installed. 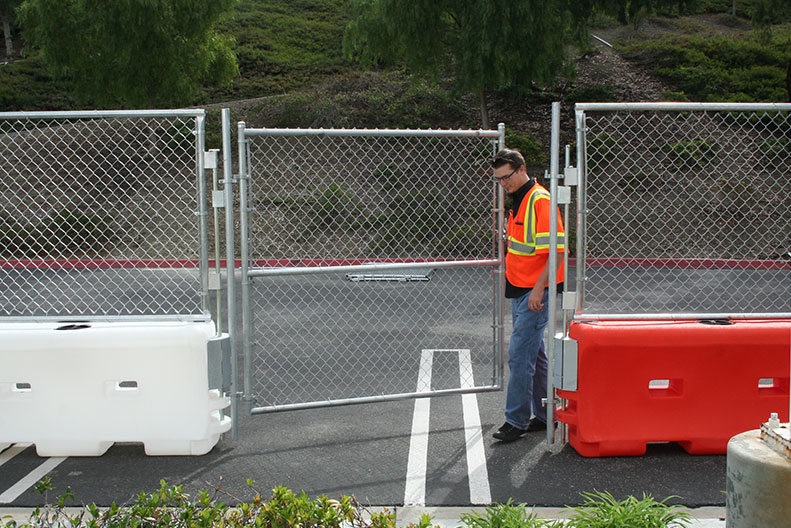 6' single or 12' double gate provides a secure entrance and exit for workers and vehicles to or from the work zone. Contact CrowdControlExperts.com at 631-367-2005 to find out more about these unique water walls and fences to secure your work area.